Spray a little bit of butter spray into each mug. Cut the bread slices into small cubes and divide them equally among the 3 mugs (2 slices per mug). Mix the 3 types of milk (3 leches), vanilla extract, and 2 eggs in the blender. Pour 1 cup of the mixture into each mug. Cook each mug in the microwave for 3 minutes. Remove the mugs and let them cool for a few minutes. 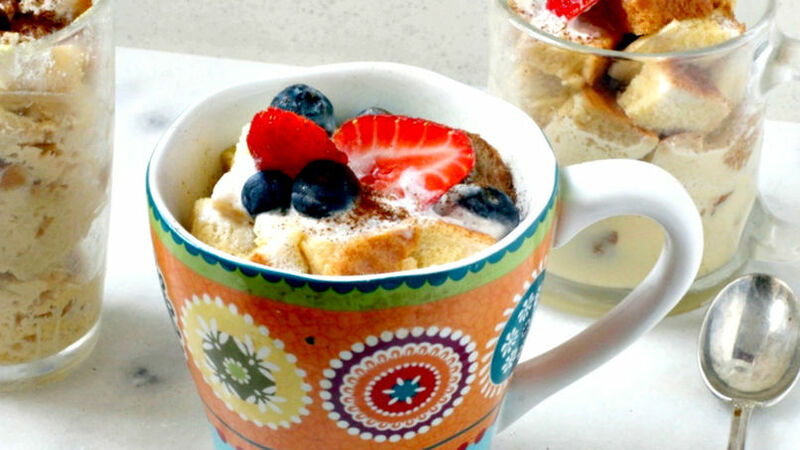 Top with cinnamon, whipped cream, blueberries, and strawberries. You may substitute whole milk with coconut milk. I didn't use extra sugar for this recipe because condensed milk provides a sweetness without being overwhelming. If you have a sweet tooth, check the 3-milk mixture for sweetness before adding the eggs. If you wish, you can garnish with shredded coconut, nuts or dried fruits. Make this delicious French toast in only 3 minutes in your microwave, either in individual mugs or—if you prefer a larger quantity—in a glass dish. I made 3 servings using my trusty mugs, and the result was exquisite!